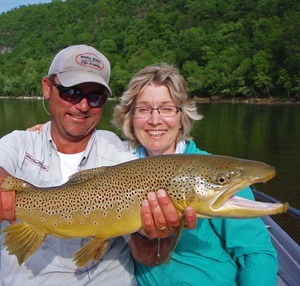 This report is updated when fishing conditions change. The water flows have been high and steady for the last month or so and the bite has been fantastic! Actually, it's been about as good as it gets! We're seeing both, numbers and quality! With the higher flows, the lake levels have dropped and are closer to normal pool again....so we should start to see lower water flows on the rivers. I expect the fishing to be just as good, if not better and even easier during the lower flows. The hot flies at this time are shad patterns, san juan worms, egg patterns and large streamers!